Landscape+Urbanism: Happy Birthday - Frederick Law Olmsted Sr. Happy Birthday - Frederick Law Olmsted Sr. In honor of Frederick Law Olmsted Sr's birthday today, April 26 (1822, so let's call it a round 190! ), I would remind folks to go out and read more about the man in the great 2011 biography 'Genius of Place' by Justin Martin (Da Capo Press, 2011). 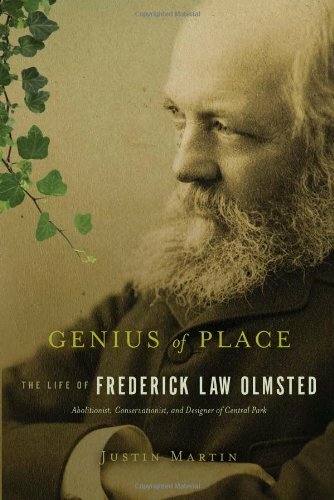 Genius of Place traces Olmsted from his beginnings in 1822 up until his death in 1903. While most well known as the creator of Central Park and in some circles as the father of landscape architecture, it's telling that much of Olmsted's life was spent in pursuits aside from park-making and design - in areas of farming, public health, journalism and the literary arts. Martin does a solid job of showing the quirks and uncommon path that Olmsted took through his varied life - captured in the subtitle "Abolitionist, Conservationist, and Designer of Central Park". Also worthy of reading is the 2000 biography by Rybczynski 'A Clearing in the Distance' and Erik Larson's more fantastical page-turner on the 1893 Worlds Columbian Exposion in Chicago in 'The Devil in the White City'. Olmsted, as the father of the profession is featured in any manner of great landscape history books (i read a good portion of the entire 7? Volume 'Papers of Frederick Law Olmsted' in college) - but for the less nerdy and bibliophilic there's plenty of summary material and locations to delve into. While we often question is pastoral scenic aesthetic sensibilities (he was a man of his time), there is much to learn in his tireless work ethic, social sensibility, and focus on ecological as well as public health -- providing models for issues that we still grapple with today. We should also emulate his shrewdness in navigating messy politics to further his agenda and get things done, which is something we could use a lot more of these days in our somewhat timid, politically safe professional bunkers. Celebrate the man and the profession, first by spelling the name correctly, and justly honoring his contribution to our profession, our cities, and our imagination. Hmm I'm going to have to read this! Happy Birthday to him and he deserves all the accolades and praise because he contributed much especially when it comes to parks where families gather to have quality time. Happy b'day to him from Montreal Québec Canada, he has designed the heart of our city, the mountain (Mont Royal) has his name dedicated to the main path leading up to the top of the mountain and its magnficient 360 degree points of views of the city. Happy b'day to him from Montreal Québec Canada! He has designed the heart of our city, our mountain (Mont-Royal). The main pathway has his name, which leads up to the top of the mountain to a magnificient 360 degree view of the city. On behalf of all Montrealers, we salute him and hope he's having his favorite cake. Also the Olmsted film at http://www.olmstedfilm.org/. Thanks Georgia - totally forgot about the film - they showed it regularly for a bit on PBS - worth the watch and gives a great overview of Olmsted's wide-ranging experience. Always dream to read this book! Happy Birthday to him, i hope the book will be as fascinating as the design of the Quebec. I'm going to read the books. He sounds like a fascinating character. Little late to this party but saw your post when researching landscaping. There are so many monuments and parks erected to this great man. Awesome acknowledgement. Thanks for reminding us of a great landscape designer and public advocate for parks. Olmsted continues to be an inspiration for us all! My respect and admiration goes to Frederick Law Olmsted Sr. He is considered the father of American Landscape Architecture. He has great contribution in making his country a better place to live.